Nellie Melba was one of the most famous opera singers of the Victorian Age. Such a colossal superstar was she that the esteemed chef Escoffier created for her a delectable dessert, Peach Melba, which he presented to the attendees of the Duke of Orléans’ grande fête for her on the back of a swan ice sculpture. Peach Melba combines two flavors that are made for each other: peaches of course, and raspberry puree. Put these on vanilla ice cream, top with spun sugar, and you are in bliss of operatic dimension. 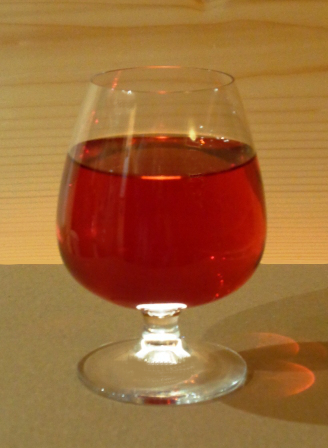 Peach Melba easily suggests itself to interpretation as a melomel, that is, mead flavored with fruit. It should certainly hint of sweetness, as Nellie Melba’s voice did, but not cloyingly, rather, surprisingly strong and clear. As raspberries are intensely fragrant, they will dominate the nose of such a melomel, but will not overpower the taste of the peaches. The flavor of the honey should be something of an embellishment, as was the spun sugar atop Nellie’s dessert. To this end choose a lighter honey, which can reliably be found among the selection of wildflower-based products from the Pacific Northwest. This example uses premium fireweed honey from western Canada, which had a lovely amber color and mildly caramel flavor. The mead is lightly sweetened with wine conditioner to an off-dry state, leaving some tartness on the tongue, but with the very smooth finish created with three years of bulk aging. You can be sure this is going to come out for a spring celebration on the Vernal Equinox! This entry was posted in Uncategorized and tagged fermentation, food, homebrewing, mead, melomel recipe, peach melba, umami, wine.